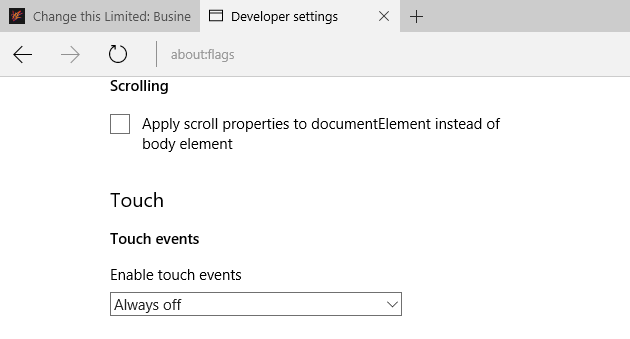 This blog will cover how to enable touch-screen interactivity on the Microsoft Edge browser, which will allow you to view our HTML dashboards on Edge. Some HTML5 dashboards – including a number of those exampled in our portfolio – contain elements that users can interact with, such as buttons and tabs. The Microsoft Edge browser is a good tool for exploring our dashboards, but for some reason, touch-screen interactivity is not always enabled by default. This blog will cover how to switch this option on. First, open up your Edge browser. Click the URL bar and type about:flags. Click Enter. This will load up the ‘Developer Settings’ page. Scroll down until you reach a section entitled ‘Touch’. 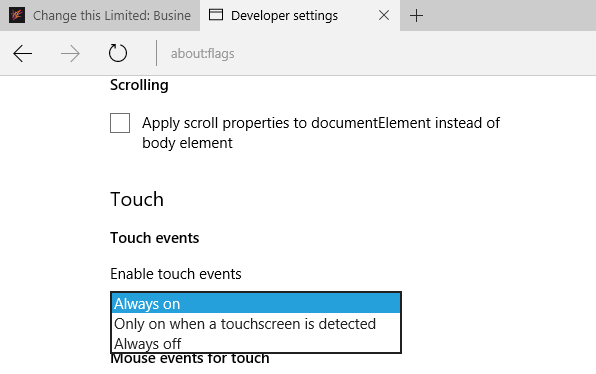 Under the section ‘Touch events’, you’ll notice that enabling touch events is set to ‘Always off’ by default. This is something of a mystery in an age where mobile computing is, for the first time, more prevalent that conventional desktop working. Click on the arrow to bring up a drop-down menu. There are two other options you can select here – ‘Always on’ or ‘Only on when a touchscreen is detected’. In order to interact with some HTML5 dashboards on Edge whilst using a mobile touchscreen device, you will need to select either one of these options. In practice, there is no difference between them so it doesn’t matter which one you choose. For this example, I’ve selected ‘Always on’. Please note that you may have to restart your Edge browser for these changes to take effect. You should now be able to view interactive HTML5 dashboards on Edge in all their glory.